The problem with having a food blog is that I am constantly looking for new places to try so I can write about them. In reality however, there are always those few places that keep you going back again and again because the food really is that good. As my regular haunts, I choose not to write about them, mainly because my opinion is likely to be biased and my food choices tend to be committed to memory. However it recently occurred to me that although such places may be regular hangouts for myself and others in ‘the know’, this world is made up of all sort and in fact there may still be people who don’t know of and haven’t tried the food. The Original Lahore (I will refer to is as ‘Lahore’) is one of those places that has been passed down from generation to generation in my family. 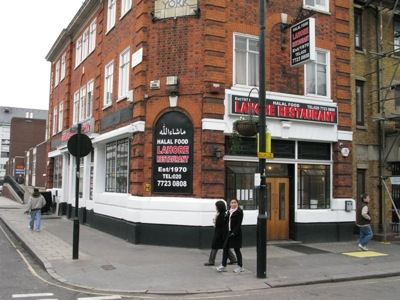 I have many a time had conversations with my dad about how my granddad used to populate himself at the original restaurant on Commercial Road. I myself remember a family dinner there some years ago, walking into a rather unimpressive space and up some rickety stairs to an area with a low ceiling. Lucky for us, the owner’s brother (apparently) has since opened up two local outlets which mean’s we no longer have to travel the distance to E.London to savour the taste of succulent meat! One of those local outlets is in St Johns Wood. Located just off Church Street on Gateforth Street, this corner plot is open and airy. Whilst I could spend a considerable amount of time describing the restaurant and decor, it would be an absolute waste as those who visit Lahore do so because of the food. The place is particularly un-fussy, but clean and tidy none the less. As I already mentioned, for those restaurants considered to be ‘regulars’ in my books, I can quite simply reel off a list of what to order. Before I go ahead and state my favourites, a word of advise: The grilled meats tend to be served on a sizzling hot plate. When placing your order, ask for the meat to be served on a regular plate instead, in particular when ordering the seekh kebab and the lamb tikka. My reasoning for this is that as the meat rests, it lets out juices or ‘rus’ as it has always been described as in my house. This rus tastes absolutely amazing when soaked into a piece of naan (especially the most bready side parts). When the meat is served on a hot plate, the heat disintegrates the rus and sometimes makes the meat a little dry! – You have been warned! So now to the best bit, what to order. Being of Indian descent, I must say that because of the quality of the Indian food provided at home, when I do go to such restaurants, I order the foods that my mother doesn’t make as often i.e. the tandoori items. Saying that, Lahore is known for its tandoori food, so it shouldn’t surprise you that my list of foods to order consist mainly of the dry delicacy. 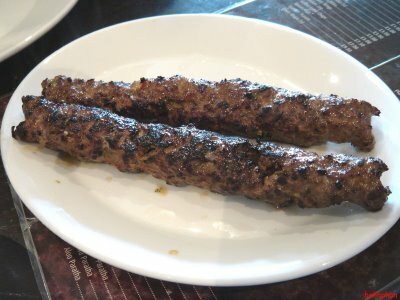 Seekh Kebab – Softer than most seekh kebab’s I’ve tried, the mean cooked just enough and full of flavour. Masala Fish – Again another usual on my list, not too spicy but excellent flavour none the less. Nehari – Meat cooked extremely slowly for a long time so that the meat literally falls off the bone! I didn’t really feel any need to describe the dishes as most people have some clue about what to order when visiting a traditional Pakistani restaurant but for those who haven’t been yet, definitely add this to your visit list!